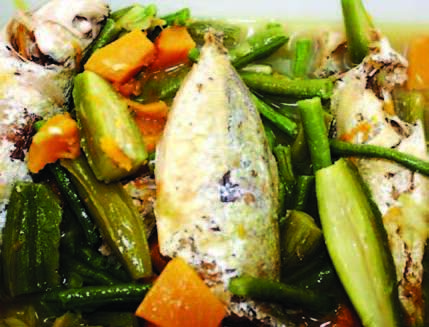 Get to know the kapas-kapas, a delicious indigenous vegetable. Kapas-kapas (Telosmaprocumbens [Blanco] Merr.) is also commonly known as adwan di dalom (Ifugao); padpadol, dugep, kuriday-ong, and dukep (Ilokano); kapuk-kapuk and latok (Tagalog); laknit (Bagobo); and sabernokum, ampupuyat, pusapusa, and bagbagkong. It can be found in thickets and secondary forests from Ilocos Norte to Sorsogon, Mindoro, Cuyo, Biliran, Leyte, Negros, Mindanao, and Basilan. This plant is also found in Vietnam, Thailand, and China. Kapas kapas flowers usually open during the summer and its fruits are numerous during the months of August to December. 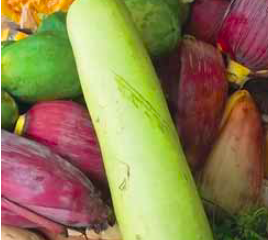 In Ilocos, flowers and fruits are sold in bunches during its season of flowering and fruiting. It is a woody vine with leaves that are thin, ovate to oblongovate, and slightly heart-shaped at the base. Flowers are green-yellow, odorless, and hairy, while the fruit is lanceolate, green, angular with four sides and narrow wings. Seeds are black, flat, and crowned with long silky hairs. 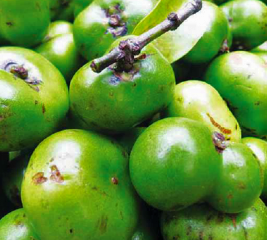 In Ilocos Norte, immature fruits are used for viands such as dinengdeng, or are roasted. They are also used as inflorescence for salads. 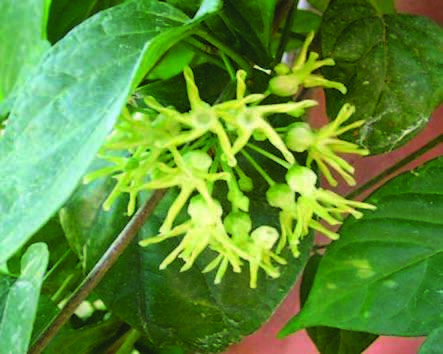 Ilocanos and Tagbanuas in Palawan use this plant for the same purposes. 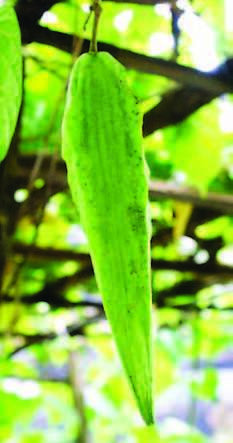 The fruits have the consistency and taste of string beans; some compare its taste to that of winged beans. Fresh leaves and stems, though, have been reported to be poisonous to pigs. 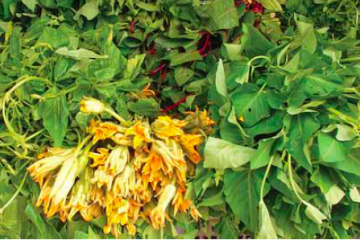 For folk medicine, an infusion or decoction of kapas kapas leaves is used to cleanse or treat wounds, scabies, and ulcers. The leaves are also applied to the forehead to treat headaches. In Vietnam, the whole plant is used as a substitute for licorice due to its sweet taste. Kapas-kapas fruit that is long and pointed. Proximate analysis of immature fruits revealed the following: 89.57% moisture, 0.62% fats, 0.73% protein, 0.59% ash, 1.30% fiber and 170 milligrams or mg gallic acid equivalent or GAE/ per 100 grams or g total phenol. An intensely sweet polyoxypregnane glycoside (telosmoside A15) with a sweetness intensity 1,000 times higher than sucrose was isolated from Telosma procumbens in Vietnam. 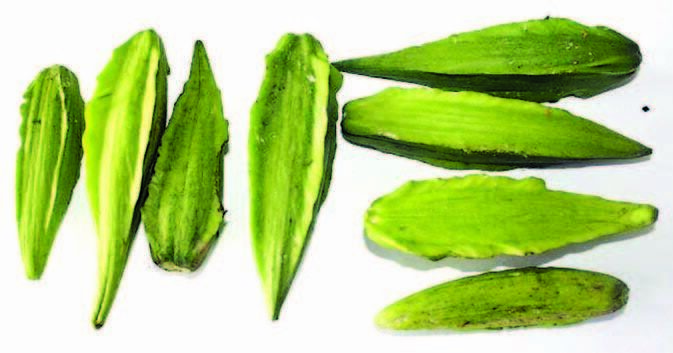 17 other recently discovered extracts of kapas-kapas leaves were also found to have anti-diabetic potential. Flowers, both opened and unopened, are made into salad, Ilocano style. Varieties: Kapas-kapas comes in a variety of fruit sizes. There are also types that are more prolific than others. There is no recommended variety so far but research is ongoing with respect to varietal selection and crop improvement. Propagation and planting: Propagation is through seeds or stem cuttings. Seed germination can take 1 to 1.5 months from sowing. Flowering commences 1.5-2 years after planting. Flowers start to emerge during the months of May to July and fruits emerge by August. Kapas-kapas is a climbing perennial, and hence requires a sturdy trellis. 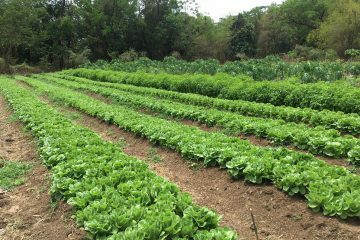 Nutrient management: Kapas-kapas is easy to grow using a low-input organic production system. 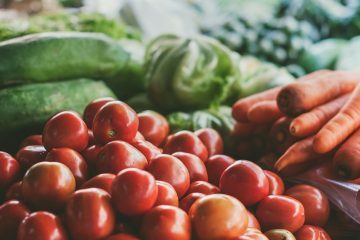 Compost, fermented juices, and other organic fertilizers can be used to supply the plant with its nutrient needs. Fertilizer application can be done every other week, either by side-dressing, drenching, or spraying. Generally, a total of 0.5-1.0 kilograms or kg/ per square meter or m2 of organic fertilizer is applied. Pest Management: Mealybugs are commonly observed throughout the life cycle of the plant. Prune heavily infested leaves or spray the plant with a soap solution infused with hot pepper. Open and unopened flowers can be harvested fresh. Fruits for consumption can be harvested a month from fruit initiation, when fruits are still tender. Fruits have good storability; once harvested, fruits remain green and fresh even if stored for a month under room temperature. Also, mature green fruits are still attached to the pods 6-9 months from fruit emergence. 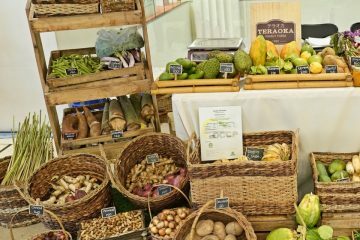 The fruits have vast potential not only as a vegetable crop but also in the nutraceutical industry due to its anti-diabetic potential. Kapas-kapas pods in dinengdeng: Bring water to a boil; meanwhile, grill or fry fish in a cooking pot. Add fish sauce before adding squash fruits, string beans, and kapaskapas, then cook until tender. Finally, add malunggay leaves and cook for a minute or two. For more information, please contact Dr. Rodel G. Maghirang, Crop Science Cluster-Institute of Plant Breeding, College of Agriculture, University of the Philippines Los Baños, 4031 College, Laguna, or email him at rgmaghr@yahoo.com.